What is paint correction? This is by far our most common question, and a very good question at that! Paint correction is an industry term that we as professional car detailers use to describe the labor intensive process of decontaminating, restoring, and rejuvenating the existing paintwork of a vehicle. If you watch the video below, you will see that the vehicle in the “before” stage has multiple surface imperfections including swirl marks & fine scratches. Surface imperfections may also include bird dropping etching, acid rain etching, holograms and polishing machine buffer trails from unqualified and incorrect car wash operatives. Most, if not all, car wash operatives, especially those at vehicle dealerships, use filler-based products to polish the paint surface of a vehicle. This process should not be confused with the term paint correction as these fillers only temporarily “mask” the surface imperfections within the paint of the vehicle. Paint correction is the actual corrective process of removing small amounts of clear coat and/or paint from the vehicle’s surface with the use of abrasive polishes in order to level out the vehicle’s painted surface. This process is usually about 2-4 hours per body panel, depending on how severe the surface imperfections are. 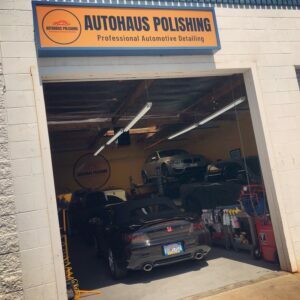 Prior to beginning any proper paint correction procedure, a thorough decontaminating wash and clay bar treatment must be performed on the vehicle to remove any bonded surface contaminants such as tar spots and industrial fallout. It is essential that these contaminants be removed before the correction process because there is a significant amount of risk that they will become dislodged and caught up in the pad of the polishing machine, which then may inflict additional damage onto the painted surface of the vehicle. If you have additional questions or would like to schedule an inspection for your vehicle, please contact us using our online messaging form or give us a call at 661-200-0710 and one of our IDA Certified techs will be happy to go over your vehicle’s needs!